Knoxville, Tennessee Affordable Dentures & Implants offers several styles of full dentures, each with special features and advantages. It’s part of our mission to put transformation within reach. 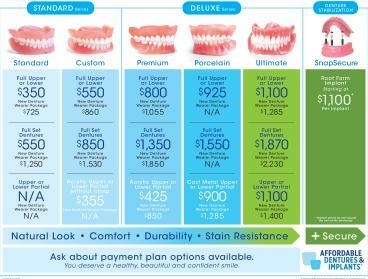 See below for more details, or call us at 865-316-6786 if you have a question about a particular style. Affordable Dentures & Implants® provides dentures, mini dental implants, tooth extractions and partial dentures that not only improve smiles, but more importantly, improve lives. Not only will you be more confident in your appearance, but you will eat better, and that can have a very positive impact on your overall health. Please fill out the form below to request an appointment. For immediate assistance, please call us at 865-316-6786.